I returned to Parc 55 (Mission conference room) to see Max Katz's (Exadel Developer Relations) "Building Mobile Apps with HTML5 and Java" Birds-of-a-Feather (BoF) presentation. Specifically, Katz is in Developer Relations for Tiggzi, a cloud-based app platform. Katz made his example public and created a TinyUrl for it. Desktops could access http://tinyurl.com/javaone12m and mobile devices could access http://tinyurl.com/javaone12m1. It was pretty impressive to be able to reload/refresh the application as he worked on it on my laptop and on my Droid. It really drove home how easy this cloud-based solution is to use and deploy. It was one of the more impressive real-time demonstrations I've seen. Katz moved onto another example that accessed data from the database rather than from Twitter's API. One of the nifty things he demonstrated was the reporting of the equivalent curl command for accessing the data via REST. All of Katz's demonstrations were implemented within the Google Chrome web browser. I was surprised at how fluid the behavior was for the most part. It seemed to have responsiveness similar to a decent desktop Java IDE. I'd say that the tool's interface itself is probably more complicated than the applications most developers would develop on it, but that could probably be said for Java IDEs as well. One of the audience members asked if Tiggzi supports SOAP. The answer was "no" and that Tiggzi supports XML or JSON over REST only. Katz recognized that we "don't want to buy stuff," but provided an overview of Tiggzi's pricing strategy (pricing based on number of deployed applications and all plans have all features). 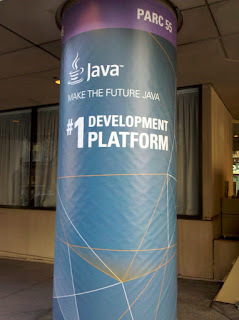 He said that if you use promo code "javaone12" at tiggzi.com you can get the Pro Plan for a trial period. The title of the session seemed a little misleading as there was next to no coverage of Java other than mention that Twitter uses Java and the first example uses Twitter. The abstract seemed a bit misleading as there was no mention of Tiggzi-specific solution in that abstract. Those points being stated, I still did enjoy the presentation and found it interesting. It's probably not something I'll be able to use in the near future, but it was fun to see and think about the possibilities.